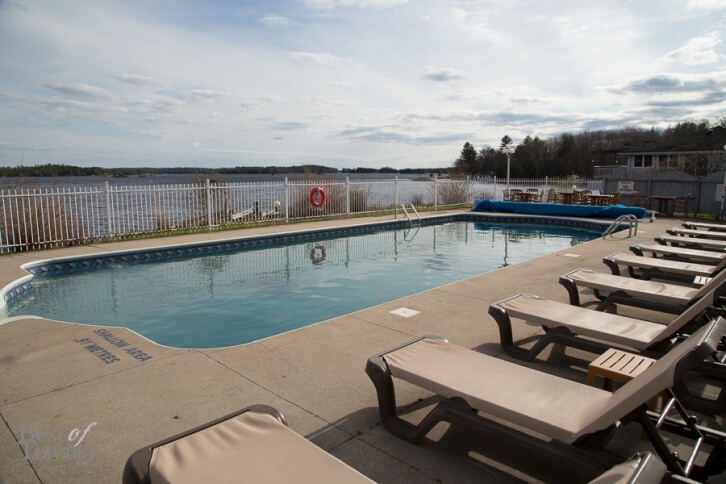 I was one of the lucky people who got an opportunity to check out the newly-renovated Viamede Resort last weekend just before this upcoming Victoria Day long weekend. Being not even two hours drive away from Toronto near Peterborough, you get a great view of quiet and peaceful Stoney Lake with no sign of civilization. Fresh air can seem almost endless out here, dare I say. Yet for someone like me who enjoys all the amenities of civilization, the creature comforts are there including wifi. It’s a convenient and perfectly relaxing escape from the hustle and bustle of city life. And isn’t that what a vacation is all about? Full service spa facilities are available by Euphoria Wellness Spa including facial treatments, manicures and pedicures, hot stone massage therapy and even services targeted for men. Of course a nice pool overlooking the lake (pictured at the top) doesn’t hurt to look at. The Viamede staff were very friendly and hospitable. The cuisine served in the 1885 dining room was top notch. I just kept eating even after I was full – everything was too good! There’s also the Boathouse Pub steps away which I enjoyed frequenting with a selection of draught beer, great pub food and karaoke. So if you happen to need long weekend plans this weekend, you really should consider the newly-renovated Viamede resort this weekend! And as an added bonus, when you mention that you heard about it from “Best of Toronto” you can get a complimentary bottle of wine and 10% off your weekend stay. For more details on vacation packages and other packages available at Viamede click here. While I was too busy relaxing and fully enjoying one of my few occasions outside of the city, here’s just a few photos I took at the weekend at Viamede Resort. The return of Bud Light Sensation: "Into the Wild"